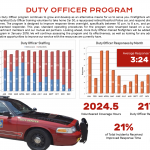 The Duty Officer program continues to grow and develop as an alternative means for us to serve you. Firefighters who have completed Duty Officer training volunteer to take home Car 30, a repurposed retired Rossford Police car, and respond directly to scenes. The program is designed to improve response times overnight, specifically between 10 p.m. to 8 a.m., and provide a guaranteed responder. We will continue assessing the program and its effectiveness, as well as looking for any additional creative opportunities to improve our service with the resources we currently have. All photos and video on this site are copyright protected and cannot be used for private or public use without written consent of the credited photographer. Photos are posted to honor and recognize our firefighters along with other firefighters and emergency response personnel that help us proudly protect our community. They are not meant to disrespect, or to dishonor any person or persons, be it a fellow emergency worker or civilian. We realize that sometimes these photos may show harsh outcomes, but they are useful as a resource for other emergency personnel to critique and we apologize for any grief they may cause. To protect victim (s) privacy, we will never show a face or other personal identifying information in our photos. We thank you for your understanding.